So big that it affects the lives of every common Malaysian. So big everyone MUST know! The Malaysian cabinet has reached a consensus. Beginning in 2012, English for Teaching Mathematics & Science (ETeMS) or Pembelajaran & Pengajaran Sains & Matematik dalam bahasa Inggeris (PPSMI) will be phased out in stages. There will be a return of BM & vernacular langauges for the teaching of Science & Mathematics in Primary & Secondary Schools. However, there will be no change for Form 6 or Matriculation. Science & Mathematics will still be taught in English for them. Following the abolishment of ETeMs, several measures will be taken to place extra emphasis on English. They will be implemented as early as next year. They include increasing classroom time for the English language, an English literature programme, a camp during the holidays & the hiring of additional English teachers. The English teachers hired will include 1000 foreigners & 600 retired teachers. The ministry is currently in negotiations with UK, India, Australia & NZ for the foreign teachers. Furthermore, retired teachers can apply with the ministry next year. Our Prime Minister has expressed that the abolishment does not signal a move away from English. There will still be an emphasis on English if not even more. The abolishment of ETeMS seems to be welcomed in the Chinese & Indian communities.The use of English was found to bring about negative effects in Chinese & Indian schools. Switching back would be a great relief & would help students understand the 2 subjects better. However, there were also ppl who were against the abolishment. This includes several of my fellow bloggers who expressed shock, disbelief & bleak predictions for the future of Malaysian children. Parents interviewed by The Star voiced dissent. Some were even threatening to transfer their children overseas or to international schools. The Prime Minister who introduced ETeMS, Tun Dr Mahathir, was saddened & thought that the future of Malaysian children is being compromised. He added that, many years ago, when he changed the teaching of Science & Mathematics from English to Malay, many teachers didn't know Malay either. However, everyone worked at it & everything worked out in the end. They could have done the same with ETeMS. Tun Dr Mahathir was responsible for the shift from English to Malay for the teaching of Science & Mathematics in the early Malaysian education system inherited from the British. Tun Dr Mahathir has started a poll on his blog chedet.co.cc to gauge public opinion on the abolishment of ETeMS. Do vote on this poll because the results will be forwarded to the government for consideration. From the renowned blog on Malaysian education, Education in Malaysia. In a post by John, he expressed great dissatisfaction that the government could have but did not, at the beginning of ETeMS, place the extra emphasis on English that they are promising now. The extra time for English lessons, the special programmes & the extra teachers would have helped to make ETeMS work. In a post by Tony, he came up with a compromise. He is calling for the government to allow urban schools to allow students to choose which language they wanted to learn Science & Mathematics in. The opinion of the great koko' himself! hahaha~~ I am so conceited! The first thing I want to do is clear the air once & for all. 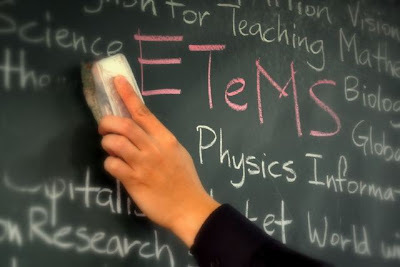 ETeMS is NOT about using Mathematics & Science to teach English or improve English. This is a very common misconception of the public. ETeMS is about using English to teach Mathematics & Science to prepare students for higher scientific pursuits in-line with Vision 2020. Now that I've cleared that up, let me just say that I am actually quite disappointed with our governments move to take the easy way out. All the extra emphasis on English that the government wants to implement today should have been implemented during the time of ETeMS to provide extra support. But little of that sort was done. Furthermore, if the ministry really wants Science or Mathematics teachers who are fluent in English, they should have selected fluent students for their teacher training programmes in the first place. I have found many newly graduated Science & Mathematics teachers who still struggle with English. They should have been screened out in the interviews instead of being allowed to graduate & contribute to the horrifying statistic that less than 20% of teachers in Secondary Schools & less than 10% in Primary Schools are proficient in English. I find it deeply disappointing that the implementation of ETeMS was half-hearted in the first place. How can something half-hearted be a success? Now, what is my take on the abolishment of ETeMS? Let me give you some background on my students who can be classified as 'rural' students. They live in longhouses along a river in the middle of a timber forest. For a lot of them, their parents do not place much emphasis on education. They can make a decent living for themselves by fishing, foraging or farming. Here, English is pretty much a foreign language with little use or relevance. Although they have 6 years of English lessons in Primary School, majority of them come to Form 1 lacking the ability to string together a grammatically correct sentence or answer simple WH questions. Some cannot even read words that urban children learn in kindergarten. I guess you know what I am going to say next. I think the abolishment of ETeMS will do them a lot of good. They will be able to learn Science & Mathematics in a language very similar to their own. Moreover, it is highly probable that they will do better at these subjects too. It doesn't matter that English will be of lesser importance in their lives. It doesn't matter if they cannot achieve higher levels of academia. What matters is they now have a better chance to gain basic scientific knowledge. What matters now is they take interest in these scientific subjects first. Abolishing ETeMS will do a lot of good for my school & I believe it will do a lot of good for other rural schools in Malaysia as well. BM would be my choice hands down. I do not believe that language is a barrier for those who are serious about science. They may struggle initially but they will get there eventually. And once they do, the experience will be an even more fulfilling one. In a perfect world, students should be allowed to choose which language to receive instruction in. The second best option for Malaysia at this time is to go back to BM.